Phansi Museum invites the public to the opening of the Postmodern NDEBELE exhibition on September 16, 2017. The exhibition illustrates how Ndebele art exploded into greatest postmodern art and architecture of Southern Africa. Ordinary, everyday people become sculptors, huts become palaces, beaded paintings become the expression of individuality. 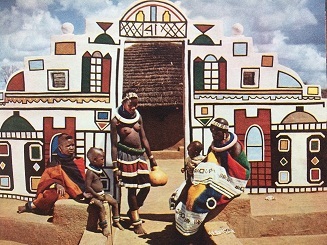 It is believed that wall decorating amongst the Ndebele began with the construction of their simple adobe huts. The wet plaster created opportunities to mould, to incise and engrave the surfaces. Geometric patterns were filled in and reinforced with lines, speckles and different shades of earth and at times pebbles. The outlines defined the geometry. Although much of this process was to beautify, it was also an annual ritual that dealt with maintenance issues and a background to ancient rituals and celebrations. The painted murals were first recognised by outsiders in the 1940’s and brought to public’s attention in 1950 with the opening of a tourist village north of Pretoria, where the geometric, non-pictorial decorations begin to promote something entirely different. Tribal rituals and feasts become major public events and festivals and places where the community could feel whole again. In order to celebrate this progression or transition, the Ndebele people turned to art. But this time, it was different - no longer the humble, modest art of their pre-war and dispersal traditions, but the loud vigorous art of the advertisers, marketers and “Fine Artists” surrounding them. The murals which in the past were a salute to the ancestors and a celebration of the rites of passage became billboards of aspirations and dreams, visualisations of the future and lights, wonderful houses and villages and distant communications through wire, travel and technology. From the 1950’s onwards façade painting under the influence of the iconic Ndebele pattern artists became somewhat prescribed and artists now explored their newfound freedom of expression in their beadwork. Architects, anthropologists and art lovers hankered after the origins of the patterns and the geometry of the Ndebele; all which transpired before the influence of western culture technology and materials. They searched for the original meanings and compositions of colours, beads and shapes and soon enough the patterns and colours of the Ndebele crept onto public buildings onto floors, billboards and walls. At the same time, art lovers and collectors started to collect ‘pure white Ndebele’ and marvel at the art. Soon enough, strong black lines began to frame the patterns and images and a transition is seen in the colour preferences of the artists and community who eventually moved away from using colours from ‘the earth’ to using bright colours they purchased from the ‘winkle’ / shop. The façade making and painting of the Ndebele drew ever more tourists and certainly put the Ndebele on the map. Not only to every other member of this community but more importantly to thousands of tourists, architects, anthropologists, home-decorators and others. Journals dug into the mysteries and began to look backwards with fantastic illustrations. At home, the proud Ndebele women continued to bead their own artworks, unrestrained by what academics wanted them to do. The artworks created for rituals, for example the brides’, and the mothers’ front aprons became canvasses (or leathers) onto which amazing aspirations and ambitions were beaded. Craft took a backseat now, a simple lazy-stitch was quite enough, the then present colour pallet of beads prevailed - geometry was the rule. No life or people were depicted, this was a time of building dream homes or palaces and this became the subject matter. With time, the buildings became flags, signals rather than aspirations. Certain signs and symbols gave away clues, such as the famous razor blade used to illustrate the celebration of a young man returning from isolation. Rituals became Art Festivals and Exhibitions and individuals, especially the girls about to become women turned themselves from modest body artists into fantastic sculptures, probably taking their cue from the Michelin Man staring down from the roofs of the great lorries traveling between mines and the neighbourhood. While Esther Mahlangu’s BMW and the British Airways kept spreading the good news of the Ndebele around the world and assisted them in gaining international recognition as fantastic folk artists. When all is considered and one carefully scrutinizes this exhibition it is evident that the Ndebele are the most obvious example in the world of Art and Architecture. The exhibition will be opened by Prof Franco Frescura on September 16 and will run until September 30, 2017.